In the above statement, it seems clear that the “land southward” and the “land northward” were bounded in some way by four seas: the “sea south,” “sea north,” “sea west,” and “sea east.” The “land northward” (mentioned 31 times) and the “land southward” (mentioned 15 times) are the major land masses or areas in which the main people groups of the Book of Mormon are said to have lived. 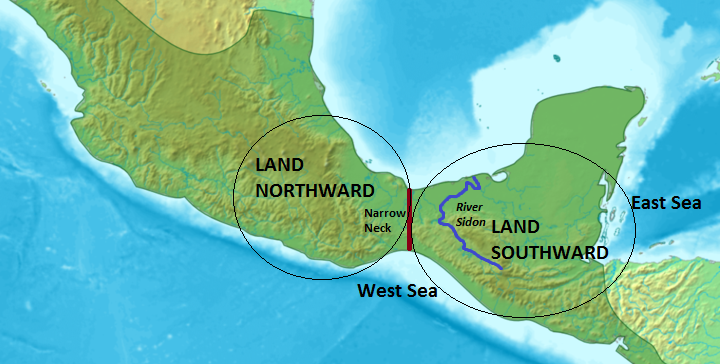 These two lands were connected by a “small neck of land,” also called a “narrow neck of land” (Alma 22:30-33; 63:5; cf. Ether 10:20). Two of these seas, those on the west and the east, appear elsewhere in the narrative (Alma 22:27, 32-33; 50:8, 11, 13; 52:11-13; 53:8, 22; 63:5; Hel. 4:7; 11:20), and Mormons universally interpret these as referring to literal bodies of water oriented at least approximately east and west of each other. However, the “sea south” and the “sea north” mentioned in Helaman 3:8 pose a serious problem. Mesoamerica is bounded by the Pacific Ocean on one side and by the Atlantic Ocean on the other. Regardless of the specific placement of the Book of Mormon lands in Mesoamerica, it is almost inevitable that the “sea west” be identified as the Pacific and the “sea east” as the Atlantic (or some part of it). But then where are the “sea south” and the “sea north”? The Atlantic Ocean waters bordering Mesoamerica can be divided into at most two seas, the Gulf of Mexico (or more specifically what is called the Bay of Campeche) and the Caribbean Sea (or more specifically the Gulf of Honduras). These two bodies of water are separated from the perspective of the region of southern Mexico and Guatemala by the Yucatan Peninsula. No plausible such division can be made for the Pacific Ocean, since the Pacific coastline runs along a fairly simple line from Honduras to Mexico in a generally west by northwest direction. 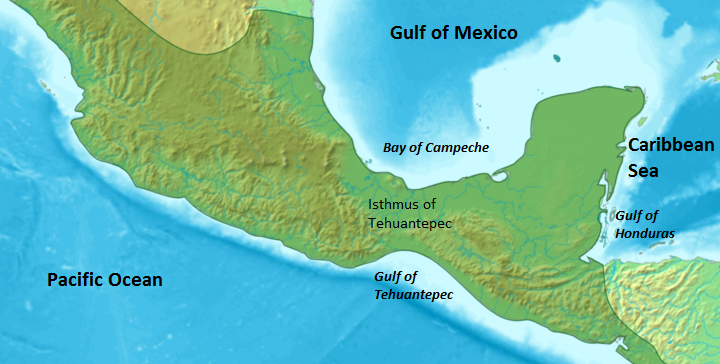 At the Isthmus of Tehuantepec, the land narrows in such a way that the ocean directly off the coast there is considered a bay or gulf (the Gulf of Tehuantepec), but it is not separated from any other part of the Pacific along the Mesoamerican land mass. Thus, there simply is no other body of water that can account for the fourth sea, and even a third sea requires a strained correlation. How is this problem to be solved? Later publications also fail even to address the problem. Sorenson’s four-hundred-page “source book,” which includes a hundred-page verse-by-verse commentary on geographical descriptions in the Book of Mormon, gives no explanation of the two seas. 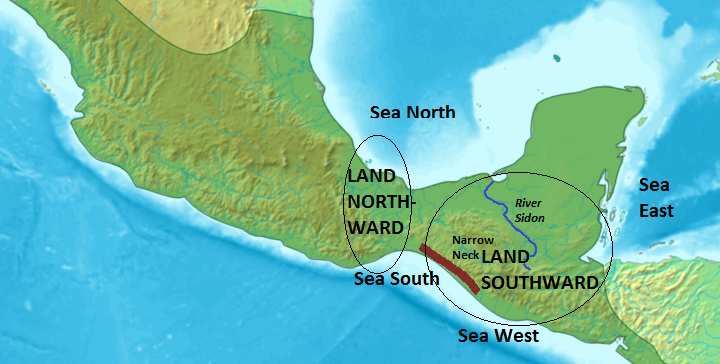 According to Sorenson, in Helaman 3:8 “the fourfold labeling of seas applies specifically to the land northward,” and in Helaman 11:20 “reference is not made to the seas north and south inasmuch as those apparently relate only to the land northward.”7 This is a debatable claim, but in any case he offered no indication of how the north and south seas might be included in his Mesoamerican model. 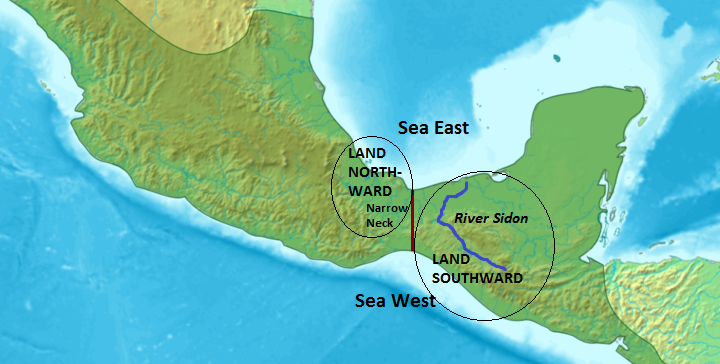 That is, even if one assumes that the four seas pertain as boundaries only to the land northward, no such four seas can be found in the region that Sorenson identifies as the land northward. In Mormon’s Map, Sorenson implied that the seas could not be taken literally: “The only way to have seas north and south on a literal or descriptive basis would be for the two major bodies of land to be oriented at an angle somewhat off true north-south. That would allow part of the ocean to lie toward the south of one and another part of the ocean to lie toward north of the other.”8 Rather than take such a view (which would be similar to that taken by Hauck), Sorenson continued to maintain that the Book of Mormon lands were bounded by only two literal seas, the sea west and the sea east.9 This is as close as Sorenson has ever come, it appears, to addressing the question of the meaning of the reference to the sea south and sea north. The difficulty with the view that the north and south seas express only general directions is that the Allens agree that the terms “sea west” and “sea east” are meant to refer to specific bodies of water. They offer no explanation for why two of the four terms should express specific references to bodies of water while the other two terms, which are precisely parallel in form and semantic structure, should not refer to specific bodies of water but express only general directions without actual referents as the basis for those directions. The problem with the Allens’ explanation may be illustrated with the following analogy. Suppose a man is giving directions to his house but he is unable to use street names. His directions read as follows: “From your house, walk about two miles toward the west lake. You’ll come to an apple orchard. Then turn left and walk about a mile toward the north lake. Before you get there you will reach the old school house. Turn to your right and walk back toward the east lake for just a short ways, and you’ll see my house with the red barn.” It is difficult to know why anyone would think that the west lake and the east lake are literal lakes but not the north lake. Clark’s justification begins with establishing precedent: “North and south sea probably have no more concrete meaning than the phrases ‘filling the whole earth’ and ‘as numerous as the sands of the sea.’”16 There are at least two problems with these comparisons. First, the expressions to which Clark compares the problematic expressions in Helaman 3:8 are not metaphorical. A metaphor is “a figure of speech which concisely compares two things by saying that one is the other,”17 as in Shakespeare’s metaphor “sea of troubles.”18 Clark’s examples are both instances not of metaphor but of hyperbole, in which language referring to something very real (the earth; the sands of the sea) is used rhetorically in deliberate or idiomatic exaggeration for effect.19 “He lives all the way out in Timbuktu” is a hyperbolic way of saying that someone lives in a remote place very far away. The hyperbolic nature of the statement does not mean that Timbuktu is not a real place. Clark’s confusion of metaphor with hyperbole is important because Helaman 3:8 obviously cannot be interpreted as using hyperbole. Whatever the references to “the sea south” and “the sea north” might mean, they cannot be understood as exaggerations for effect. Technically, Clark’s second example does use simile, a comparison using the word “as” or “like” (or the equivalent in a different language). The expression “as numerous as the sands of the sea” is a simile that compares the number of people to the number of grains of sand in or at the sea. Thus, his second example uses both hyperbole and simile—but not metaphor. “The sands of the sea” is not a metaphorical reference to something else. Second, it is entirely implausible to interpret Helaman 3:8 as mixing figurative and literal usages of expressions that are semantically parallel. If “from the sea south to the sea north” is figurative, then “from the sea west to the sea east” should be as well. Such mixing of literal and figurative elements, when the expressions are of the same type and appear to be used in the same way, makes no sense. (The qualifications are important here; obviously, figurative language is often used alongside literal language.) It would be a little like saying, “They spread out from the Shire to Mordor, from California to Maine” (though even this statement would not be “metaphorical”). Perhaps a creative person could invent a scenario in which such a statement might be made, but the proper presumption when faced with a statement expressing apparent geographical references is that either all of them are fictitious or all of them are factual. Certainly this would be the case with such prosaic expressions as “the sea south,” “the sea north,” “the sea west,” and “the sea east.” To interpret the first pair of these expressions as non-literal but the second pair as literal is simply bad exegesis. Despite Clark’s continued use of the category metaphor to explain the references to a sea south and a sea north, at this point his argument has actually shifted to another sort of explanation altogether. What he is really suggesting is that the Book of Mormon references to the south and north seas reflect a pre-scientific, mythical “geography” of ancient thought, according to which the world was an island floating on a single ocean or sea. There are references to wilderness in all four cardinal directions, found scattered throughout the book of Alma (2:36-37; 8:3; 16:6-7; 22:27-31; 25:5, 8; 31:3; 50:7, 9, 11; 43:27; 62:34). However, these references appear to be giving quite prosaic descriptions of literal directions, movements, and activities at or near those wildernesses, not expressing an idealized description of the land surrounded by wilderness. The first reference to wilderness in Alma is a good example: “And they fled before the Nephites toward the wilderness which was west and north, away beyond the borders of the land; and the Nephites did pursue them with their might, and did slay them. Yea, they were met on every hand, and slain and driven, until they were scattered on the west, and on the north, until they had reached the wilderness, which was called Hermounts; and it was that part of the wilderness which was infested by wild and ravenous beasts” (Alma 2:36-37). Obviously the reader is supposed to understand that the wilderness on the west and north was a literal wilderness. Moreover, the Book of Mormon states explicitly twice that the entire “land southward” was a wilderness (Alma 22:31; Ether 10:21). As for the four seas, there is not one statement in the Book of Mormon expressing the notion of the earth as resting on water or a sea. The only statement which might suggest that the lands of the descendants of Lehi (not the whole earth) were surrounded by seas is Helaman 3:8. This text clearly does not refer to the whole earth because the Book of Mormon narrative distinguishes between the land from which the Lehites came and the land or lands in which they lived following their journey across the sea. 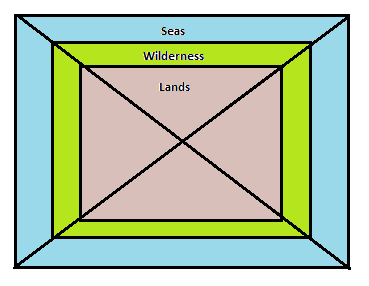 It is even possible to understand the four seas as large, separate bodies of water that do not completely surround the lands. As has already been pointed out, the wording of the text—“from the sea south to the sea north, from the sea west to the sea east”—precludes taking the seas west and east literally (which all of the views discussed here do) but not the seas north and south. The precisely parallel structure and wording of the two prepositional phrases in this prosaic narrative context make the half-literal, half-figurative interpretation quite impossible. Gardner misses this point when he claims as precedent for this interpretation the finding that the expression “the other side of the sea” in Mesoamerican texts from the Colonial period was a metaphor. Assuming that expression is figurative, it simply does not support the claim that the “sea south” and the “sea north” in Helaman 3:8 are figurative. Not only does the Book of Mormon language not support the “metaphorical” or “mythological” interpretation, that view does not find clear support from ancient descriptions of the world. Figure 6. 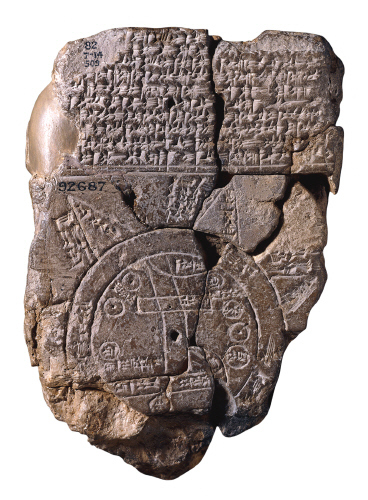 “Babylonian Map of the World” (ca. 7th cent. BC). Image licensed under public domain via Wikimedia Commons. Of course, virtually all Mormons today have abandoned the hemispheric model of Book of Mormon geography, for a variety of good reasons. However, the Mesoamerican models suffer from their own problems. One of these is the reference in Helaman 3:8 to four seas. The evidence shows that this reference fits a hemispheric view of the Book of Mormon lands and that this view was accepted by most Mormons throughout the nineteenth century. Close analysis of the various explanations offered by LDS scholars in the past thirty years has shown that they are simply unable to give a plausible account of the “sea north” and “sea south” in Helaman 3:8. The simplest explanation is that the Book of Mormon was composed as a modern fiction on the assumption that its lands constituted both North and South America. 1. The focus of this article is on the various Mesoamerican models of Book of Mormon geography, which dominate LDS scholarship in and out of Brigham Young University (BYU) and popular Book of Mormon apologetics (e.g., FAIRMormon). Thus, this article will not discuss the Heartland models (which place the Book of Mormon lands in the Great Lakes region) or the South American models (which place the lands in and around Peru). 2. See the maps in F. Richard Hauck, Deciphering the Geography of the Book of Mormon (Salt Lake City: Deseret, 1988), inside front and back covers. 4. V. Garth Norman, “The Definitive Mesoamerican Book of Mormon Lands Map,” Ancient America Foundation; see also his book, Book of Mormon—Mesoamerican Geography: History Study Map, 3rd ed. (American Fork, UT: ARCON/Ancient America Foundation, 2008). Oddly, Norman’s map labels the Bay of Campeche as both the sea north and the sea south. 5. See the map in F. Richard Hauck, “Recent Book of Mormon Research in Central America: Ancient Writing Systems,” Meridian Magazine, Oct. 11, 2012. 6. John L. Sorenson, An Ancient American Setting for the Book of Mormon (Salt Lake City: Deseret; Provo, UT: FARMS, 1985), 7, 11, 20, 23 (Maps 1-4). Helaman 3:8 is cited three times in Ancient American Setting, 16, 266, 336, but the question of the sea north and the sea south is never mentioned. 7. John L. Sorenson, The Geography of Book of Mormon Events: A Source Book (Provo: FARMS, 1990), 289. 8. John L. Sorenson, Mormon’s Map (Provo, UT: FARMS at BYU, 2000), 20. 9. See the maps in ibid., cover, inside front and back covers, and for discussion, 18-19. 10. Cf. John L. Sorenson, Mormon’s Codex: An Ancient American Book (Salt Lake City: Deseret; Provo, UT: BYU—Maxwell Institute Press, 2013), 22, 712, and Maps 1 and 3 (following p. 366). 11. Joseph L. Allen and Blake J. Allen, Exploring the Lands of the Book of Mormon, rev. ed. (American Fork, UT: Covenant Communications, 2011), 634. 12. John L. Lund, Mesoamerica and the Book of Mormon: Is This the Place? (n.p. : Communications Co., 2007). 13. John E. Clark, “A Key for Evaluating Nephite Geographies,” Review of Books on the Book of Mormon 1 (1989): 63-67 (20-70); repeated in “Revisiting ‘A Key for Evaluating Nephite Geographies,’” Mormon Studies Review 23, 1 (2011): 39-41 (13-43). 17. Tom McArthur, “Metaphor,” in The Oxford Companion to the English Language, ed. Tom McArthur (New York: Oxford University Press, 1992), 655 (653-55). 18. “To be, or not to be? That is the question— Whether ’tis nobler in the mind to suffer The slings and arrows of outrageous fortune, Or to take arms against a sea of troubles, And, by opposing, end them?” (Hamlet, in Hamlet, Act 3, Scene 1). 19. McArthur, “Hyperbole,” in Oxford Companion to the English Language, 491. 22. William J. Hamblin, “Basic Methodological Problems with the Anti-Mormon Approach to the Geography and Archaeology of the Book of Mormon,” Journal of Book of Mormon Studies 2/1 (Spring 1993): 189 and n. 97 (161-97). 23. Brant A. Gardner, Second Witness: Analytical & Contextual Commentary on the Book of Mormon (Salt Lake City: Greg Kofford Books, 2007), 5:65. 24. Frauke Sachse and Allen J. Christenson, “Tulan and the Other Side of the Sea: Unraveling a Metaphorical Concept from Colonial Guatemalan Highland Sources,” Mesoweb Publications, 2005, cited in Brant A. Gardner, "From the East to the West: The Problem of Directions in the Book of Mormon," Interpreter: A Journal of Mormon Scripture 3 (2013): 143-45 (119-53). 25. Francesca Rochberg, “The Expression of Terrestrial and Celestial Order in Ancient Mesopotamia,” in Ancient Perspectives: Maps and Their Place in Mesopotamia, Egypt, Greece & Rome, ed. Richard J. A. Talbert, Kenneth Nebenzahl Jr. Lectures in the History of Cartography (Chicago: University of Chicago Press, 2012), 32 (9-46); Wayne Horowitz, Mesopotamian Cosmic Geography, Mesopotamian Civilizations 8 (Winona Lake, IN: Eisenbrauns, 1998), 29-30. Cf. Wayne Horowitz’s earlier article, “The Babylonian Map of the World,” Iraq 50 (1988): 147-65. 26. Horowitz, Mesopotamian Cosmic Geography, 30. 27. Rochberg, “The Expression of Terrestrial and Celestial Order in Ancient Mesopotamia,” 44. 28. Georgia L. Irby, “Mapping the World: Greek Initiatives from Homer to Eratosthenes,” in Ancient Perspectives, ed. Talbert, 89, 91 (81-107). 29. Horowitz, Mesopotamian Cosmic Geography, 41; Irby, “Mapping the World,” 93-94. 30. Cf. John H. Walton, Ancient Near Eastern Thought and the Old Testament: Introducing the Conceptual World of the Hebrew Bible (Grand Rapids: Baker Academic, 2006), 174-77. 31. Royal Skousen, ed., The Book of Mormon: The Earliest Text (New Haven, CT: Yale University Press, 2009), 740. 32. The Book of Mormon, translated by Joseph Smith, Jun., Division into Chapters and Verses, with references by Orson Pratt, Sen. (Liverpool: William Budge, 1879; Salt Lake City: Bureau of Information, 1907), 434. 33. Orson Pratt, An Interesting Account of Several Remarkable Visions, and of the Late Discovery of Ancient American Records, 3rd ed. (New York: Joseph W. Harrison, 1842), 16-18. 34. Orson Pratt, Divine Authenticity of the Book of Mormon, No. 6 (Liverpool: R. James, 1851), para. 8, 32. 35. John L. Sorenson, The Geography of Book of Mormon Events: A Sourcebook, rev. ed. (Provo: FARMS, 1992), 9-11. 36. Ethan Smith, View of the Hebrews; or the Tribes of Israel in America, 2nd ed. (Poultney, VT: Smith & Shute, 1825), 82; see also the edition View of the Hebrews: 1825 2nd Edition, ed. and intro. Charles D. Tate Jr., Religious Studies Center Specialized Monograph Series 8 (Provo: Religious Studies Center, BYU, 1996), 57.